“There could not be a more important question than how we are to decide what to believe,” says Brian Morley (10). Morley, professor of philosophy and apologetics at The Master’s College, sees value not simply in apologetics but in understanding the various approaches to apologetics. To that end he has written a thorough book aimed at helping readers understand those various approaches. Mapping Apologetics is a book of comparisons. In it the author examines the key thinkers and shapers of Christian philosophy in the contemporary world and how they relate to each other. This volume is a tremendous guide to understanding not just the key thinkers, but the key ideas in modern apologetics. There are plenty of apologetics volumes available to the interested reader. Volumes on individual approaches (presuppositionalism, evidentialism, Reformed Epistemology, etc. ), on specific subjects (theistic proofs, the defense of the resurrection, the problem of evil, etc. ), and on individual philosophers abound. Yet Morley offers readers something more in Mapping Apologetics. He wants readers to “gain a good grasp of this crucial field of apologetic methods” (12-13). In order to do that he walks readers through a schema ranging from fideism to rationalism. His chart progresses along the spectrum of blind faith to total dependence upon reason, with each move from left to right bringing more evidence to bear on the issue of faith. It is an incredibly helpful chart, with admitted shortcomings. Under each heading he examines some of the key ideas of apologetics by means of examining the foremost thinkers associated with various approaches. Under the presuppositional approach Morley reviews both Van Til and John Frame. He analyzes Alvin Plantinga under the Reformed Epistemology heading, and E.J. Carnell, Gordon Lewis, and Francis Schaeffer under what he terms the Combinationalist approach. Classical Apologetics gets the most interaction, with an assessment of the works and methods of Richard Swinburne, William Lane Craig, and Norman Geisler. Finally, under the Evidentialist heading he examines John Warwick Montgomery and Gary Habermas. There are reasons he doesn’t explore every approach in detail, and he clarifies that in the writing. At an already daunting 366 pages of comparative work I am glad he forewent the desire to interact with every one in equal detail. The book is impressive not just in scope but in attention to nuance. Morley is an erudite scholar. As John Frame wrote in his endorsement, “Morley shows mastery of the details.” This is true not just of Frame’s approach but of all the approaches. He gives readers a brief introduction to the philosopher under review, some of their history and how they came to the conclusions they did, and then works meticulously through their body of work to unpack the finer points of their positions. He then gives readers a brief summary and some of the common critiques of the scholar. He also includes a list of key terms associated with each scholar, which helps to make this volume accessible to even the most novice of aspiring apologists. His attention to detail makes this volume as useful as an encyclopedia on apologetics. Most readers will not likely work through it chapter by chapter, and that’s okay. As a resource it will give readers a thorough survey of a major approach as developed by one of its leading thinkers. Readers can quickly gloss the major criticisms or reference its key terminology. While Morley is not able to survey everyone, in the way an encyclopedia might, he gives us no less detail on the key thinkers he does address. In the process he doesn’t just give us academic histories, he gives us an introduction to the major ideas of contemporary apologetics. He introduces readers to the relationship between faith and evidence, fact and theory, and the capabilities of the fallen mind. In that regard it is an introduction to apologetics by means of methodological survey. Whether an advanced student of the discipline or a new student Mapping Apologetics will serve you well. I can’t imagine future apologetics students doing research without this tool at hand. 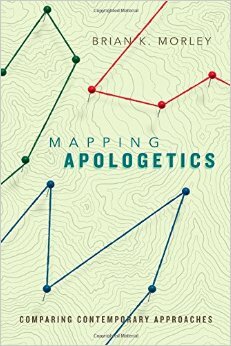 I highly recommend Brian Morley’s Mapping Apologetics.